Survivors often have a lot of time to question, to reflect. Why did this happen? How do I go on? A similar reflection is found in the Japanese proverb: "Fall down seven times, stand up eight," a proverb that exemplifies courage and resilience, or the spirit of what it means to be a survivor. You're invited to attend Stand Up 8, a concert benefiting The Aneurysm and AVM Foundation (TAAF). Enjoy the soulful sounds of singer/songwriter Julie Dillon and the global groove of the band etaoin shrdlu as they entertain an all-ages crowd at the ever-cool, Octopus Literary Salon. Tickets are $15 in advance, $20 at the door, and 80% of ticket proceeds go to TAAF. 100% of on site donations benefit TAAF too, so bring a few extra bucks for swag, door prizes and more! Proof of ticket purchase required at door. All participants must read and agree to the Media Release to be eligible to purchase tickets. By purchasing tickets for Stand Up 8: A Concert Benefiting The Aneurysm and AVM Foundation, I give my full permission to The Aneurysm and AVM Foundation (TAAF) and the artists performing to use any photographs, videotapes, audiotapes, or other recordings of me that are made during the course of this event. I understand that this Waiver and Release may be stored electronically and agree that a copy is authentic and admissible as evidence in any future dispute or proceeding. The Aneurysm and AVM Foundation (TAAF) is a 501(c)3 non-profit organization dedicated to bettering the lives, support networks, and medical care of those affected by aneurysm and other types of vascular malformation of the brain. Stand Up 8 is an all ages concert; no ID is required for entrance. However, if you will be using your credit card to buy anything, from tickets and refreshments to a donation to the Foundation, your ID will be required. 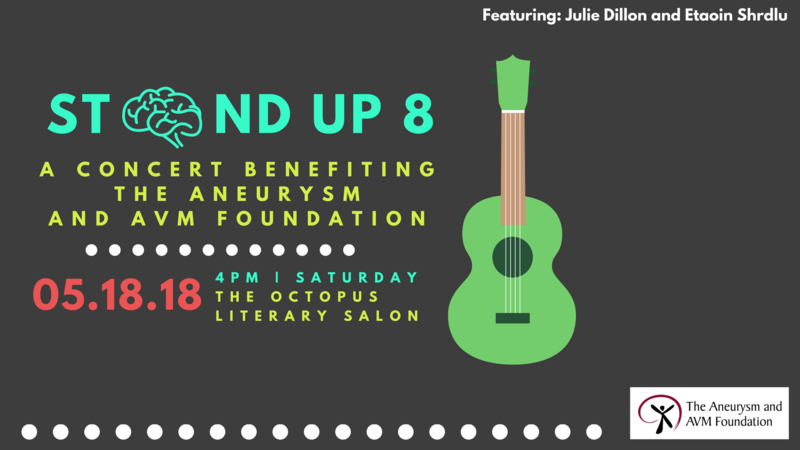 Stand Up 8 will be held at the Octopus Literary Salon which is located at 2101 Webster St #170, Oakland, CA 94612. Public transportation is readily available; get off at the 19th Street BART station. You can park at Center 21 Parking, 2353 Webster St, or Douglas Parking just to name a few. No food or drink is allowed to be brought into the venue, but do bring an appetite as they serve refreshments if you're so inclined. Otherwise, we're accepting donations and will have swag, door prizes and more on hand; so bringing a few extra bucks would be appreciated. This is a benefit concert; there are no refunds. But do know that proceeds from the evening benefit the awareness, research and advocacy programs of The Aneurysm and AVM Foundation (TAAF). Please read more about us at www.TAAFonline.org. You must bring proof of ticket purchase, so please bring your ticket or the email. Ticket must match the name of the person who attends unless otherwise arranged by a representative of the organizer. For questions, please email Dina Chon at dina@TAAFonline.org.